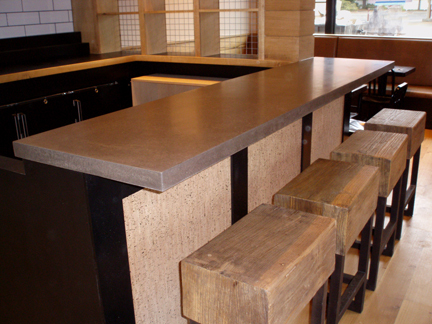 Custom bar tops in wood, concrete, glass, sheet metal, and cast metals for commercial and residential projects. Custom Wood Bar Tops made with premium hardwoods. A wide variety of wood species are available and are all finished with permanent waterproof Marine Finish. Engineered Concrete Bar Tops are a versatile and durable option for modern bars and restaurants which can be made in any color, size, or shape to fit your project. Custom sheet metal bar tops in stainless steel, zinc, pewter, bronze, and copper. Design unique bar tops that are the perfect fit for your project. Regular and Fusion glass bar tops for residential and commercial projects. This modern material is ideal for cocktail bars and home wet bars. Cast metal bar tops are a quick and affordable option for projects that require a decorative edge and include a unique shape. View a sampling of completed commercial bar tops here. Visit these locations to get a glimpse of the quality of bar tops we can fabricate for you. "The counter tops for my wet bar and cabinet are just beautiful. I have gotten so many wonderful compliments from family and friends. In addition, the installers that came to my house were professional, polite and meticulous."